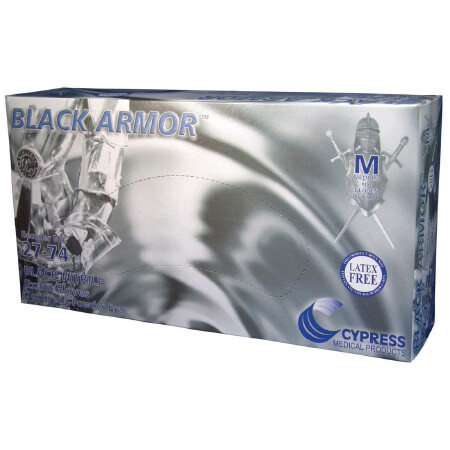 Black Armor nitrile powder-free exam gloves offer an excellent combination of strength and comfort. The unique black color masks stains, inks and dyes and also provides a contrasting background for lightly colored substances. The product of choice for the tattoo, law enforcement/corrections markets, these black nitrile gloves are designed to minimize latex allergy/protein concerns and feature a textured finish to promote slip resistance in wet or dry conditions. Black Armor Powder-Free Textured Nitrile Exam Gloves - X-Large. Excellent conformability provides superior fit and extended wearer comfort.